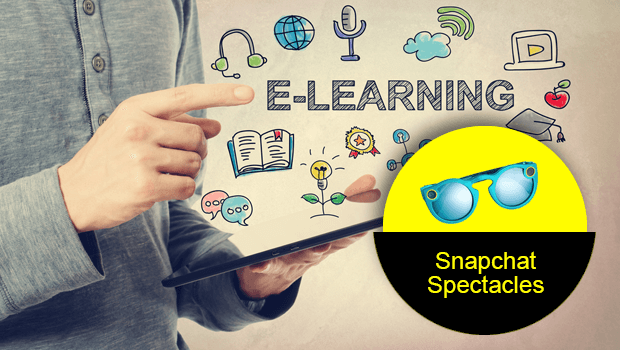 Snapchat Spectacles – Will it be Useful in eLearning? Last week saw the announcement of Snapchat Spectacles – from the makers of Snap mobile app, which has rebranded itself with this launch. An introduction (marketing) video of Snapchat Spectacles. In short, it allows you to record 10-second videos and send them to your phone. Here’s a video explaining more about how it works. There are differing points of view at the moment. Time magazine believes Snapchat Spectacles could become a huge hit. While Snap’s CEO calls the Spectacles as a toy, CNBC believes they could be more than just a toy. TheNextWeb disagrees and thinks Spectacles are a joke. One thing that sets Snapchat Spectacles apart from the high profile Google Glass is the price; of course it also aims to do much less than what Google Glass did. At $130, it’s coming at a fraction of the $1500 price that was set for Glass, and that certainly makes it a ‘toy’. I personally find them useful to record short bits especially when traveling/holidaying. A sequence of 20 – 50 such 10-second clips would make a great memory album. – recording experiences and sending them back to a system for evaluation/record keeping or even as learner portfolio. – recording a situation to explain where you are stuck and then sharing them on company/public social platforms seeking help/advise. – reflecting on your own experiences via the short clips. There is some potential but not a huge one that is clearly evident as of now. But the great thing about such products, and invariably the price points, is that it can trigger a lot of innovation around the basic concept. We will certainly be exploring this more in weeks to come.